Executive SUV services for your Honolulu Airport transportation – very suitable for business meetings or important gatherings that require a touch of class. Let Royal Hawaiian Limousine provide you this VIP treatment in every Oahu tour and transfer services that you book from us. Having been in this business for more than 10 years, RHL has managed to become one of the most trusted name in when it comes to car service from Honolulu Airport. Our chauffeured vehicles will fetch you from the airport and take you to your hotel or destination safely and comfortably. When booking our Executive SUV services, please indicate the number of passengers. This car can conveniently accommodate 1-3 persons, extra passengers will cost extra charge. You may also prefer adding a Hawaiian lei on the package for better aloha experience. Grab this opportunity to travel like a VIP in Honolulu City, Hawaii at the most reasonable price. RHL will make sure that your airport transfer will be a memorable one. Call us and discuss with us your other Honolulu Airport transfer options. Our friendly staff will be happy to answer your inquiries. You may also fill out our reservation form for your advance booking. 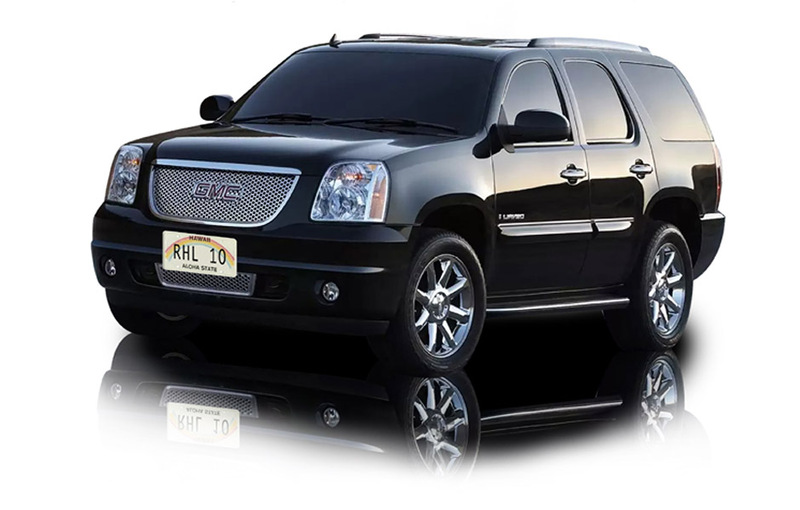 Check out Royal Hawaiian Limousine’s Executive SUV Service Packages. Note: EXTRA PASSENGER WILL BE ONLY $20 CHARGE WITH OUT LEI AND $30 WITH FRESH HAWAIIAN LEI.